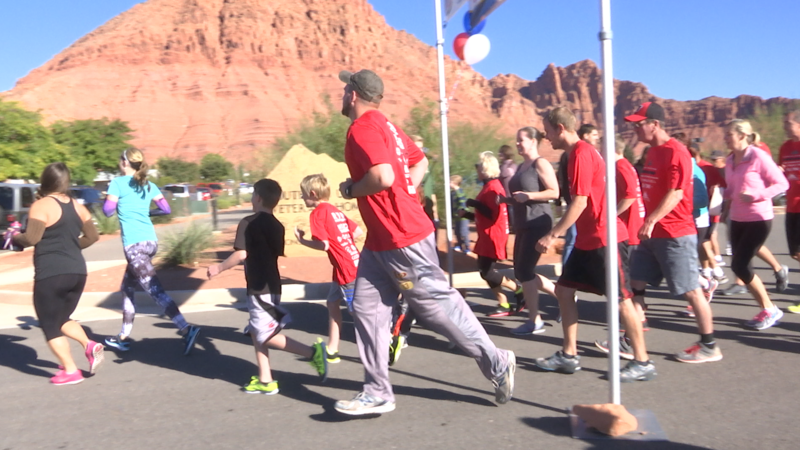 IVINS — While some chose to spend their chilly Saturday morning sleeping in, others chose to venture into the cooler weather to show their support to area veterans at the Veteran’s 5K and Fun Run at the Southern Utah Veterans Home. 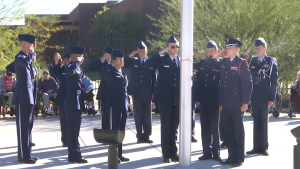 With Veteran’s Day only four days away, Vie Van Noy of the Southern Utah Veteran’s home said the organizers thought that hosting the event the Saturday before would allow everyone to participate in honoring the veterans when they would otherwise have school or work. While the fun run portion is meant to be the heart of the event, Van Noy said, they decided to add in a 5K run as well to cater to those who may have more extreme tastes. 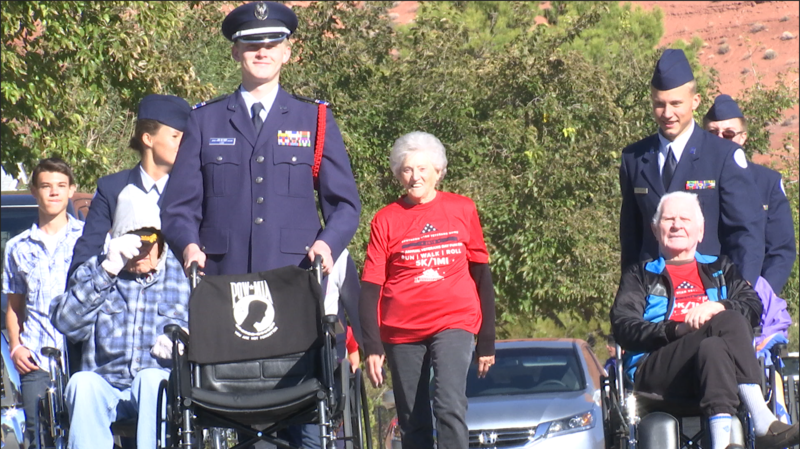 To assist the veterans in trekking the 1-mile Fun Run, cadets from the Washington County JROTC volunteered their time to push the veterans in wheelchairs, leaving the starting line at the veterans home and traveling east up Snow Canyon Parkway before turning around and making their way back. Along the way, Cub Scouts dotted the corners and sidewalks, helping out any way they could and showing they too wanted to honor the veterans for their service and sacrifices. At the front of the wheelchair line, one chair was left empty as a symbol of all those who have served in the armed forces but did not return home. 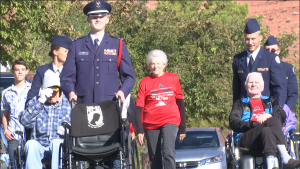 Two of the event participants, Kamberee Dalton and Linda Frost, said they think it’s important for everyone, especially younger children, to not turn a blind eye to those who have fought for their country. While she has recently been participating in many different kinds of runs with friends from her work, Dalton said this run was especially important because of those it honors. While this run may have only been the second one the home has organized, Van Noy said she was excited to see such a great turnout and hopes the numbers will continue to grow as the years progress. 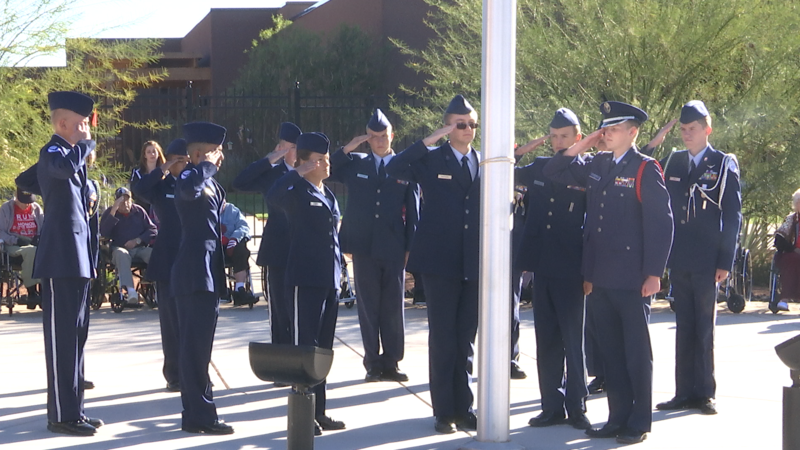 The money gathered from the event was given entirely to the JROTC, Van Noy said, and she was pleased to announce this year they would be donating $800 to the organization to go towards sending cadets to leadership camps. While it is that time of year where war veterans are on people’s minds, Van Noy said, any community members who may be looking to help out local veterans throughout the year are always welcome to lend a hand. Veterans Aware: Whatever it takes; ropes course?